Francesca was the eldest of the three children of Felipe Reyes and Juliana Santos. She had her early schooling at the Meisic Elementary School, Tondo Intermediate School and Manila High School in Tondo, Manila. She obtained her High School Teacher's Certificate (HSTC) in 1923, her Bachelor of Science in Education degree in 1924 at the University of the Philippines (UP) and her Master of Arts degree in 1926 also at the UP. In 1922, while still studying at the university, she worked as student assistant at its department of physical education. After graduating, she served there as instructor of physical education, then assistant physical director and, finally, as director in charge of women. In 1927, Dr. Jorge Bocobo; then UP president, sent her to the provinces to research on folk songs and dances. As a result, the university was able to exhibit Philippine dances at the Philippine Carnival Auditorium. In 1929, as a UP fellow, she took graduate courses in physical education at the Sargent College of Physical Education, Boston University, where she received her certificate in physical education in 1931. She also attended the summer session at Harvard University in 1930. Upon resuming her position at UP as Physical director for women in 1930, she continued her research. In 1934, Mrs. Aquino became a member of the UP president's advisory committee on dances and songs. Wishing to save the native dances from oblivion, Dr. Bocobo gave the committee full moral and financial support. 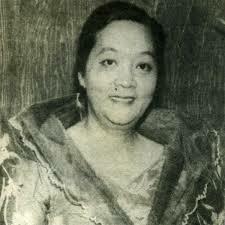 Together with Antonio Buenaventura and Ramon Tolentino, her first husband who died in 1939, Mrs. Aquino was commissioned to collect and record the country's songs, dances, music, costumes, musical instruments, and customs. Every summer, she would go to the remotest barrios in the provinces, gathering her material directly from the old natives who used to sing and dance during their younger years. While she studied the dance steps and movements, Buenaventura recorded the folk music and Tolentino took still and moving pictures. Most of the old folks were willing and eager to dance before the visitors, but some had to be bribed with food or money before they would agree to perform. Just to be able to contact probable sources, she sometimes had to go up the mountains on horseback, or cross-rivers and streams. Once, the members of the research team almost lost their lives when their banca was tossed by strong, heavy waves in the open sea. In her researches, Aquino was able to gather about 50 basic steps and 200 folk dances of various modes and colors. She discovered that people living near the sea had dances about fishing and rowing, those in the coconut regions performed dances using coconut shells, and those in rice-producing provinces had dances depicting various stages of planting and harvesting rice. She also observed that the natives in economically self-sufficient areas had gay and livelihood dances, while those in places where livelihood was hard, dances were sad, slow and even mournful. When Bocobo was appointed Secretary Public Instruction, he requested the transfer of Mrs. Aquino to the Bureau of Education. There, she became supervisor from 1940 until 1947, when she was appointed superintendent of physical education to the Department of Education. She held this position up to her retirement in 1964. While serving as supervisor at the Bureau of Education, she had all the opportunity to actively promote the revival of folk dances through the public schools. She organized the bureau’s Folk Song and Dance Club which was composed of public school teachers and high school students serving as its adviser with Serafin Aquino, who became her second husband in 1946. The club conducted weekend rehearsals and programs in different schools to drum up interest in Philippine folk dances among their faculty and student populations. In no time at all, folk dances became regular part of their physical education program, with their private schools later following suit. Aquino organized the Philippine Folk Dance Society, a non-profit cultural organization, and once served as consultant to the world-famous Bayanihan Dance Company. Today, folk dances are performed not only for enriching our cultural heritage but also in promoting tourism and international goodwill. Ramon Magsaysay Award for government service in 1962. Aside from doing field researches, Aquino also wrote books, 15 in all, and various articles on folk dances. In 1959, the Philippine Public School Teachers Association elected her as representative to the World Conference in Teaching Profession in Washington, D.C. In her mid 70’s, she received the highest honor any Filipino artist could hope for – the National Artist Award, which was conferred on her on June 12, 1973. She was the first woman to be conferred this prestigious award. The last two honors she received were the Karangalang Plaridel, given by the provincial government of Bulacan in 1974, and a certificate of recognition from the YWCA of Brooklyn, New York. Francisca Reyes-Aquino died on November 21, 1983. She was given a state funeral and buried at the Libingan ng mga Bayani. She left behind a daughter, Mrs. Cecilia T. Martinez, an only child by her first marriage. In 1991, the Sentrong Pangkalinangan ng Pilipinas celebrated the Francisca Reyes-Aquino Commemorative Year and, in February of that year, the CCP Rehearsal Hall was named Bulwagang Francisca Reyes-Aquino. CCP Encyclopedia of Philippine Art Volume 5. Manila: Cultural Center of the Philippines, 1994 via the National Historical Commission of the Philippines. Daily Express, May 24, 1973, p.1 via the National Historical Commission of the Philippines. Quirino, Carlos. Who’s who Philippine History: Tahanan Books, 1995 via the National Historical Commission of the Philippines.